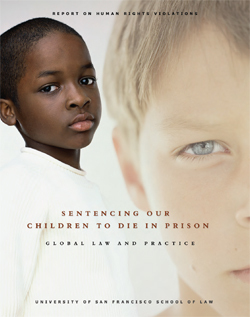 The practice of sentencing juvenile offenders to die in prison by imposing life without parole has been abolished by the vast majority of countries in the world, yet thousands of children are serving the sentences in prisons across the United States, according to a report released by the USF School of Law’s Center for Law and Global Justice. With at least 2,381 children sentenced to life without the possibility of parole in the United States, and seven such cases in Israel, the two countries are the only remaining nations continuing to impose the sentence, which violates international law. This report may be accessed in PDF format here.